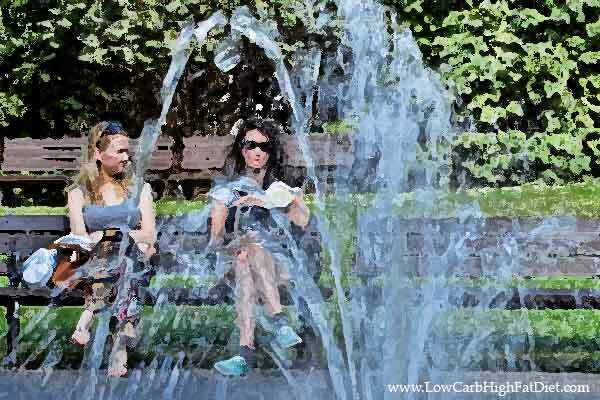 One of the interesting facts about eating in a low carb high fat way is that you lose your appetite. It’s not that food doesn’t taste good, you just don’t feel that same craving you used to get. The lack of simple carbohydrates in your diet means there isn’t a trigger element forcing you to get up every couple of hours and refuel. Eating low carb high fat mean the body has a pretty steady source of energy. The body transitions from consuming carbohydrates, which pass through quickly, over to consuming fat. (If your body is anything like mine, it tends to have plenty of that.) What’s more, that fat is consumed in a more slow and steady way. You don’t get a sudden burst of energy, and then a sudden drop. Your energy level is relatively even. I like the overall feeling. But the problem is that I have to remind myself to eat. Often I’ll find myself at lunch time not really feeling hungry. Its not that I had a big breakfast either. I’ve never been much of a breakfast eater. A couple of boiled eggs, maybe some cottage cheese, or maybe just a couple of slices of salami and cheese. If I were counting calories, even with all the fat that I take in, breakfast still wouldn’t count for very much. When lunch time rolls around, I’m just not feeling like eating. It’s only been a couple of hours since I had breakfast. My body is still slowly and gently digesting the food that it needs. I’m getting my energy from food that I ate a long time ago, as the fat slowly eases into my system. There isn’t an immediate relationship between when I eat and when I have energy, because my energy level is very steady. On the other hand, when I eat a lot of carbohydrates, they shoot directly into my bloodstream and give me a quick burst of jittery energy. That can be fun, and it can be annoying, but either way it doesn’t last long. The energy drops quickly, and leaves me feeling tired and hungry. And it’s a kind of tired and hungry that makes you crave more carbohydrates. The cycle isn’t good. But it’s important to eat regularly. The body has rhythms that it builds around when you eat, just the way that it builds rhythms of healing around when you sleep. Living in our society, eating three meals a day is a rhythm that people structure their days around. When you start following a different pattern, but don’t adjust the rest of your life to match it, you start getting out of balance. So I tend to eat a late lunch. It’s easier for me than trying to eat right at noon. Also, the restaurants in my neighborhood tend to be very crowded during lunch, because so many workers are going there to grab a quick bite and rush back to the office. If I can schedule my lunch time around 1 o’clock, I get to sit and have a more leisurely meal, which suits me well since my appetite isn’t driving me to gobble my food down quickly. The best way of course is to bring my lunch with me. I’ll often bring a small box of rinsed salad with some meat, maybe some cheese, and a bottle of water or maybe a diet soda. I do still drink diet soda. I haven’t found that the sweeteners are a problem for me, although I know many people who do have problems with any sweetness, or have concerns about the chemicals in artificial sweeteners. Everybody has to make these decisions based on their own body and how it responds. It’s easy to find a place to eat. I’m fortunate to live and work in a city that has a thriving downtown with a lot of interesting plazas. I like to settle down by a fountain, and maybe do a little bit of writing while I eat. Since I’m not eating quickly, I have time to do something else at lunch. It calms the mind, and creates a solid break in the middle of the day. I’d be curious to hear what other people are doing when it comes to lunch. Do you always break for lunch? When you’re not feeling hungry, do you take it as an opportunity not to eat? Or do you remind yourself that your body needs fuel even if you don’t feel the same urgent need that eating carbohydrates left you to with?